Apple CEO Tim Cook has come out in support of his company's most recent foray into audio innovation, saying the wireless AirPods that recently went on sale are a "runaway success" with customers. An Apple exec backing an Apple product shouldn't be too much of a surprise though - and Cook declined to share any actual sales numbers, something the company has a habit of doing with everything but the iPhone. Either the AirPods really are in high demand or Apple just isn't making many of them - if you order the wireless earphones today you can expect to see them turn up at your door sometime around February, which is quite a lead time. eBay prices for the AirPods are also heavily marked up at the moment - another sure sign of a product that a lot of people are eager to have - so Apple must be doing something right with its next-gen earbuds. Cook also told CNBC on the floor of the New York Stock Exchange that Apple is "making them just as fast as we can" to keep up with demand, whatever that level of demand happens to be. Cook was apparently touring the NYSE with his nephew while on a Christmas vacation from Apple duties. 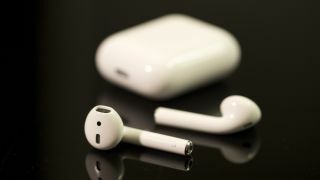 We doubt we'll ever know just how many AirPods Apple has sold - it's likely the earphones will get rolled into the "Other" category in the company's financial reports, alongside the Apple Watch, the iPod and the Apple TV.